It’s amazing to me that I haven’t written about Pumpkin Ridge before this. 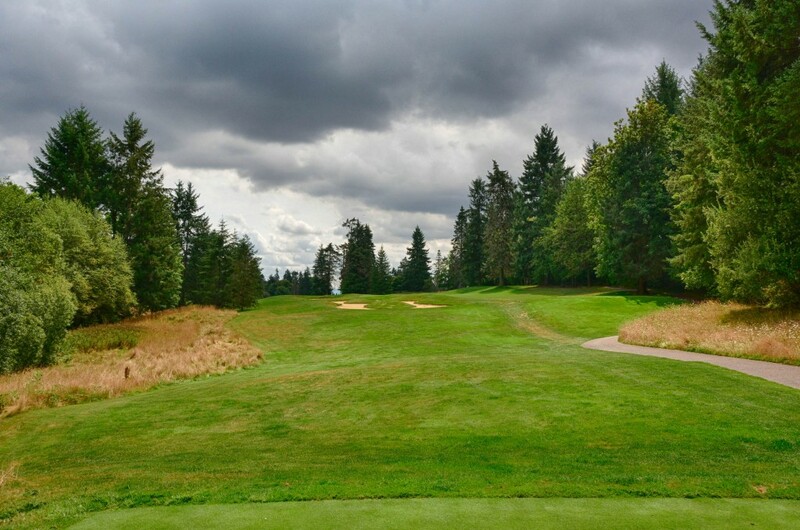 I’m about a year and a half into my quest to play the Top 100 and Top 100 Public courses in the US, and the Ghost Creek course at Pumpkin Ridge is the closest one to my home in Portland, OR. I’d played the course once about three years ago, and earlier this summer I got to play the private side, Witch Hollow, but I hadn’t had a chance to photograph Ghost Creek, which is #63 on the Greatest 100 Public Course list. Through an instagram contest I won a free foursome from NW Golf Guys (thanks guys!). If you’re in the Portland area, definitely check them out as they’re one of the better public clubs I’ve seen. I grabbed three of my friends and we headed out to the course this week, and just hoped that the thunderstorms they were calling for held off long enough for us to get a good round in. Pumpkin Ridge is about half an hour from downtown Portland, in North Plains. It’s got two courses the public Ghost Creek, and the private Witch Hollow course which has hosted two Women’s US Opens (1997, 2003) and is known as being the place where Tiger Woods won is 3rd US Amateur in a row. That being said, Ghost Creek is in no way an inferior course. There are separate clubhouses and driving ranges for the two courses, and the complex is easily the nicest in the Portland area. 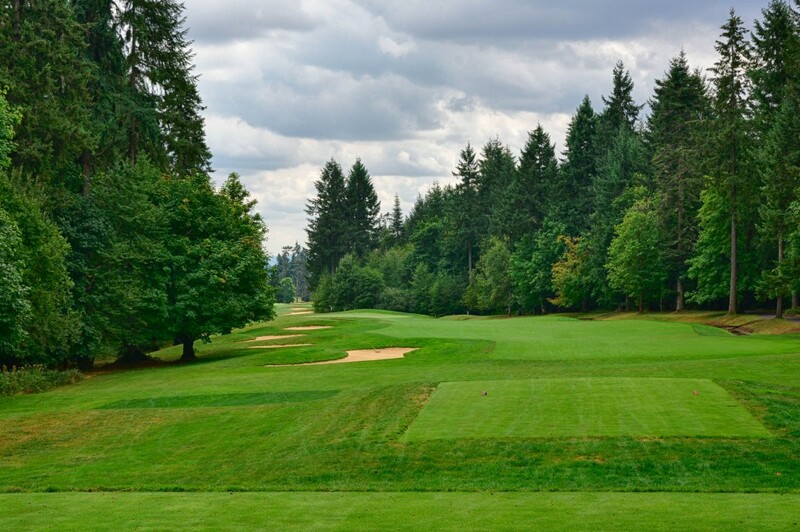 While the practice facilities aren’t quite on the same level as Columbia Edgewater, and it might not have the history of Portland Golf Club or Waverly, it easily has the best two course combo in the region. After playing so many courses this last year, I think I just kind of wrote off Pumpkin Ridge, as last time I played I was 1) Not nearly as good of a golfer and 2) Didn’t appreciate some of the finer aspects of course design. This go around I was truly able to enjoy the course and really loved the way some of the holes made you think. Although I suppose it shouldn’t surprise me I enjoyed Pumpkin Ridge as much as I did considering Crosswater, another Cupp design, is one of my favorite courses. All distances are from the white tees, as that’s what we played. You can click any photo for the larger slideshow. When you step up to the first tee, you’re in a wide open meadow – and this could have been what threw off my expectations. 10, 1 and 9 all run parallel to each other and in my mind I remember the course being a little bit more secluded. The first hole is a relatively long par 4 with a slight dogleg right and a bit of an elevated green. Nothing too crazy here, but you’ll have to hit a solid drive to get within range of a short to mid iron, and is a solid opening hole. You notice the tall grass everywhere which not only adds to the aesthetics of the course, but adds an extra layer of trouble for when you’re not in the trees. The second hole is a mid-length par 4 that really starts to bring you into the ground. The tee shot is a little bit tough because the fairways is slanted up to block your view of the green – you can generally only see the top of the flagstick. The fairway and the bunkers close in near your landing spot, and then open back up. You have to decide if you want to go driver and clear it all or hit a wood into a narrower opening. This was just the beginning of many interesting choices Pumpkin Ridge forces you to make. The first par 3 is a fun one. It plays downhill over a ravine. The green has multiple tiers and if you’re on the wrong one, you’ll have your work cut out for you. In 1993 David Duvall hit a hole in one here in the final round of the Nike Tour Championship and went on to win the tournament. If you want to play the par 5 4th well, you need to plan out your route from the beginning. It’s a dogleg left with plenty of room for your drive, it’s the second shot that is really tricky. The fairway narrows down considerably all the way to the hole, and the lies are all very uneven. Ideally you’ll want to be a wedge away, because the large green has three tiers, and can be really tricky and misleading. This is the #1 handicap hole for a reason. “Ghost Creek” makes it’s first appearance on the par 5, 5th hole. The course’s namesake comes from a creek that seems to randomly appear on holes and then disappear again, only to show up later on in the course. 6-8 is one of my favorite stretches on the course. The creek runs the length of this hole, so careful on the right side of your approach. Trouble around the green on 6. 7 is a pretty long par 4 that makes you decide how gutsy you want to be off the tee. Pick a line over the bunkers and decide how strong you’re feeling that day. The farther left the easier your approach is. Too far right, and you’re going to have a long approach. Watch out for the Donald Ross-esque fore-bunkers at the green, they make distance difficult to judge. Trust your yardage. Depending on your tees, this is a reachable par 5 with a postage stamp sized green. We were playing from under 500 yards, but usually you’re looking at closer to 560. If you catch a slope, you can get some good roll, keeping this well within reach. If you go for it in two err towards the left side, as there is plenty of room over there. The best of the meadows holes that I mentioned earlier, number 9 is ripe with challenge. Ghost Creek runs down the right, and you’ve got a lake to contend with towards the green. Aim left of the tee and you have a safer shot, but will have a lot of water to clear on your approach. Aim right and you bring the creek into play. The fairways on the course were in excellent shape, however the rough wasn’t quite as brutal as I remember it being on Witch Hollow – which was on par with Bethpage Black and Cog Hill for thickness. Probably the easiest par 5 on the course. It’s short, and very reachable. Even if you can’t quite get there, you should be able to leave yourself a sand wedge and give yourself a birdie shot. If laying up on your second shot, watch out for the creek. After some frustrating bogeys on the front I went par, par, birdie on 8, 9 and 10 to get myself back in it. Ghost Creek meanders it’s way from 10 over to 11 (actually it flows from 11 to 10, but thats just semantics). Pay close attention to pin placement on this one. The farther back, the more afraid you should be. I chunked my tee shot and ended up right on the opposite side of the creek. Often at Pumpkin Ridge you’ll find that if you miss big, you’ll be ok. It’s those little misses that can really kill your score. 12 is a fun par 4 dogleg right. If you hit it straight out you’ll be leaving yourself a long approach. However the ballsier you get over the low trees to the right will dictate just how short your approach is. The right side of the fairway will leave you with the best angle at the green, and keep you from having to clear a bunker that’s tucked right up against the front. A pretty straight forward short par 4. Hit it straight with a wood or long iron and get give yourself a good look at getting it close. Short is better than long on your second shot. One of the toughest par 3s on the property. 14 is long at over 200 from the whites, and the green is massive, so watch out for some inevitable three putts! I thought 15 lacked a little bit of interest, and seemed kind of similar to the 4th, as a similar length par 5 dogleg left. If you go too far right off the tee, the trees can become an issue, but otherwise the fairway is pretty open. If you’re going to try and go for it in two things get a little more interesting with the tree to the right and an intimidating bunker guarding the left front of the green. This starts one of the best finishing stretches of any course I’ve played – and shows that they built this course for championship use. 16 on the surface is the easiest hole on the course, but if you put the pin in the corner it can force you to take a pretty scary approach over some of the deep bunkers that surround the green. Probably my favorite hole on the course, because it has the potential to make or break your round. A drivable par 4 with water to the right of the green, bunker on the left, and a burn in the middle of the fairway. If you’re a stroke back with 2 to play you might be tempted to do something crazy, that could pay off in a big way. You can go hybrid or wood off the tee to give yourself a little chip up to the green, but that brings the burn into play. The smart move is to take a mid iron just short of the creek, to give yourself about 100 yards in. I had the round of my life going, so I played it smart with a 6 iron, and finished with par. A birdie on 18 meant I’d break eighty for the first time ever. If you layup, this will be your second shot. 18 can prove just as disastrous as 17 if you’re not careful. A long par 4 that usually plays into the wind, you’ll want to bomb your drive to keep your approach as short as possible. The last thing you want to do on 18 is hit it in the water on the right. I was on in 2 and had a 20 footer for my 79. Three putt for an 81. While frustrating, it was a fantastic day and one of the best played of my life. Like I said earlier, we played Ghost Creek from about 6,000 yards, which is really short, but it also brought a new dimension to the course. Just about everything was reachable, and it forced me to think about the course in a different way – and balance my risks with conservative shots that wouldn’t blow up the score. I don’t know why my expectations weren’t higher. Maybe it’s because I’ve played so many other course from around the country, but it was a fantastic reminder that there is some great golf right in my own back yard. If you find yourself in the Portland area definitely take the time to check the course out. You can get twilight tee times for as low as $65 peak season, and almost half that in the off season (that said, I’ve heard it’s not the best draining course in the winter).